Elementary Statistics 9 Edition NOTE: Before purchasing, check with your instructor to ensure you select the correct ISBN. Several versions of Pearson's MyLab & Mastering products exist for each title, and registrations are not transferable. To register for and use Pearson's MyLab & Mastering products, you may also need a Course ID, which your instructor will provide. Used books, rentals, and purchases made outside of Pearson If purchasing or renting from companies other than Pearson, the access codes for Pearson's MyLab & Mastering products may not be included, may be incorrect, or may be previously redeemed. Check with the seller before completing your purchase. 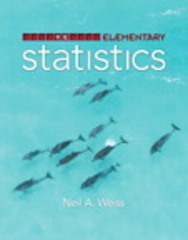 Weiss’s Elementary Statistics, Ninth Edition, is the ideal textbook for introductory statistics classes that emphasize statistical reasoning and critical thinking. Comprehensive in its coverage, Weiss’s meticulous style offers careful, detailed explanations to ease the learning process. With more than 850 data sets and over 2,350 exercises, this text takes a data-driven approach that encourages students to apply their knowledge and develop statistical understanding. This text contains parallel presentation of critical-value and p-value approaches to hypothesis testing. This unique design allows the flexibility to concentrate on one approach or the opportunity for greater depth in comparing the two. Note: You are purchasing a standalone product; MyStatLab does not come packaged with this content. MyStatLab is not a self-paced technology and should only be purchased when required by an instructor. If you would like to purchase both the physical text and MyStatLab, search for: 0321989678 / 9780321989673 Elementary Statistics Plus MyStatLab with Pearson eText -- Access Card Package Package consists of: 0321847997 / 9780321847997 My StatLab Glue-in Access Card 0321929713 / 9780321929716 MyStatLab for Business Statistics Sticker 0321989392 / 9780321989390 Elementary Statistics Students, if interested in purchasing this title with MyMathLab, ask your instructor for the correct package ISBN and Course ID. Instructors, contact your Pearson representative for more information.